(22) S'rî S'uka said: 'Uddhava, having heard how the cowherd girls were longing to see Krishna, in order to pacify them thereupon related to them the message of their Sweetheart. (23) S'rî Uddhava said: 'You have dedicated your minds unto the Supreme Lord Vâsudeva and are thus honorable to all people because you, good selves, therewith fulfilled your life's purpose [of modeling the emotions of relating to Him]. (24) By means of donations, vows [of poverty, celibacy and fasting], sacrifices, using prayer beads [japa], studying and by turning inward, concentrating and meditating, as also by other kinds of auspicious practices [see also yama, niyama, vidhi and bhâgavata dharma], the bhakti, the devotional service is realized unto Krishna. (25) The unexcelled [standard of] devotion unto the Supreme Lord Uttamas'loka, that by you good people fortunately has been established, is even hard to attain for the sages. (26) To your great fortune you have chosen to leave your sons, husbands, physical comforts, relatives and homes for the sake of that superior, male personality called Krishna. (27) By the wholehearted love that ruled you because of your separation from Adhokshaja [the Transcendental Lord] oh glorious ones, you have done me [the Lord and everyone] a great favor. (28) Please, good ladies, listen to the message that I as a faithful servant of my master came bringing to you from your Beloved for the sake of your happiness. Third revised edition, loaded March 20, 2014. S'rî S'uka said: 'When the women of Vraja saw him, the servant of Krishna, with his long arms, with his lotus eyes, wearing a yellow garment and a lotus garland, with his effulgent lotus like countenance and polished earrings, they were quite astonished and wondered where this handsome, young man came from and to whom he belonged who wore clothes and ornaments like those of Krishna. Talking like this they all eagerly crowded around him who enjoyed the protection of the lotus feet of Uttamas'loka [the Lord Praised in the Scriptures]. With due respect bowing down before him in humility and shyly smiling with their glances, sweet words and such, they asked it him, after first having taken him separate and offered him a seat, for they had understood that he was an envoy of the Husband of the Goddess of Fortune. 'We know that you arrived here as the personal associate of the chief of the Yadus who, as your Master, has sent you here to satisfy His parents. We really would not know why else He should have thought of this cow place. Even for a sage the bonds of affection with one's relatives are difficult to relinquish. The interest in others manifested out of self-interest proves itself as friendship for as long as it takes; it is a pretense as good as the interest of bees for flowers or of men for women. Prostitutes abandon a penniless man, citizens deny an incompetent king, graduates leave behind their teacher and priests leave [their attendants] after being compensated. Now that Uddhava, the messenger of Krishna, had arrived in their midst, the gopîs who thus with their words, bodies and minds were focussed on Krishna, put aside their worldly concerns. Without restraint they sang and cried in the constant remembrance of the youth and childhood activities of their Sweetheart. One gopî [noted as Râdhâ, see also *] seeing a honeybee as she meditated on the association with Krishna, imagined it to be a messenger sent by her Beloved and spoke as follows. The gopî said: 'Oh honeybee, you friend of a cheater, do not touch my feet with your whiskers still carrying the kunkum from His garland, the powder that rubbed off from the breasts of a rival lover. One who sends a messenger like you is derided in the assembly of the Yadus. Let the Lord of Madhu [Himself] be of mercy with the women [instead] [prajalpa **]! One time He made us drink the nectar of His bewildering lips and then suddenly abandoned us like we were some flowers. I wonder why the goddess of fortune [Padmâ] serves His lotus feet just like you [oh bee]. That must be so because her mind, alas, has been stolen by Krishna's chitchat [parijalpa ***]. Oh mister sixlegs, dear bee, why are you singing so busily about the Master of the Yadus in front of us who are old friends of this Friend of Vijaya [Arjuna] who left behind their homes? You better sing of His topics before His [new] girlfriends, the pain of whose breasts He [now has] relieved. His sweethearts will provide you the charity you seek [vijalpa *4]. Which women in heaven, on earth and below would not be available to Him who, so unattainable, can deceive you with His charming smiles and arching eyebrows? When the wife of the Fortunate One is of worship in the dust of His feet, what then would be our value? Luckily for those feeling bad about it, there is the sound vibration [to be chanted of] 'Uttamas'loka' [ujjalpa *5]. Keep your little head away from my feet! I know you, you expert who as a messenger from Mukunda learned the diplomacy of flatter! Why should I make amends with Him who, so ungrateful, has abandoned us, we who for His sake in this life have left behind their children, husbands and everything else [sañjalpa *6]? Against all rules He [as Râma, see 9.10 & 11] as cruel as a hunter shot the king of the monkeys [Vâlî], was conquered by a woman [Sîtâ], disfigured a woman driven by lust [S'ûrpanakhâ, the sister of Râvana] and, after consuming His tribute, [as Vâmana] bound up Bali like a crow [see 8.21]. Therefore enough of all friendliness with that Black Boy who impossibly can be given up when we keep talking about His stories [avajalpa *7]. Those ears are freed from all sins, who just once enjoyed but a drop of the nectar of the pastimes that He constantly performed. Such a one is completely liberated from the duality, wherefrom any [personal, material] sense of duty is instantly ruined. For that reason many people here [in Vrindâvana], by therewith rejecting their miserable homes and families, end up wretched and, just like birds, practice the livelihood of begging [abhijalpa *8]. We, taking His deceptive words for true, just like the black deer's foolish doe wives who trust the hunter's song, repeatedly experienced this sharp pain of lust that was caused by the touch of His fingernails. Oh messenger, I beg you, talk of something else [ajalpa *9]! My sweet little friend, have you been sent back here by my Beloved? Please ask me what you want, you are to be honored by me my dearest. Why are you here raising in us these [amorous] feelings for Him that are so impossible to relinquish? For is, oh gentle one, His consort the goddess of fortune S'rî, not always present with Him on His chest [pratijalpa *10]? S'rî S'uka said: 'Uddhava, having heard how the cowherd girls were longing to see Krishna, in order to pacify them thereupon related to them the message of their Sweetheart. S'rî Uddhava said: 'You have dedicated your minds unto the Supreme Lord Vâsudeva and are thus honorable to all people because you, good selves, therewith fulfilled your life's purpose [of modeling the emotions of relating to Him]. By means of donations, vows [of poverty, celibacy and fasting], sacrifices, using prayer beads [japa], studying and by turning inward, concentrating and meditating, as also by other kinds of auspicious practices [see also yama, niyama, vidhi and bhâgavata dharma], the bhakti, the devotional service is realized unto Krishna. The unexcelled [standard of] devotion unto the Supreme Lord Uttamas'loka, that by you good people fortunately has been established, is even hard to attain for the sages. To your great fortune you have chosen to leave your sons, husbands, physical comforts, relatives and homes for the sake of that superior, male personality called Krishna. By the wholehearted love that ruled you because of your separation from Adhokshaja [the Transcendental Lord] oh glorious ones, you have done me [the Lord and everyone] a great favor. Please, good ladies, listen to the message that I as a faithful servant of my master came bringing to you from your Beloved for the sake of your happiness. The Supreme Lord has said: 'You women are actually never separated from Me ever being present as the Soul of All. Just as all the elements, the ether, the fire, the air, the water and the earth are part of all beings, I am there as the union of all the elements of the mind, the life air, the senses and the natural modes. By means of Myself I create, destroy and sustain Myself in Myself, through the power of My deluding potency consisting of the material elements, the senses and the modes of nature. The soul full of pure spiritual knowledge, that separately exists free from the association of the modes, is perceived [as the constant witness] in the operations of deep sleep, dream sleep and waking consciousness. The mind by which one meditates upon the objects of the senses constitutes a mirage, just as a dream constitutes an illusion when one wakes up. Staying alert one should bring that what [in the mind] gathers from the input of the senses under control [compare B.G. 2: 68 and 6: 35-36]. Just as the ocean is the end station for all the rivers, this [insight] is the end conclusion of all Vedic literatures, analysis and yoga, of all intelligent people, renunciation, penance, sense control and truthfulness [compare B.G. 2: 70]. The fact then that I, so dear to your eyes, am situated so far away from you, is according to My wish that your mind - that is subjected to attraction - meditates upon Me. The mind of a woman remains absorbed more when her lover is far away than when she has him present before her eyes. Because in the constant remembrance of Me your minds are totally absorbed in Me and free from all restlessness, you will see Me appear soon. S'rî S'uka said: 'The women of Vraja hearing the instructions thus imparted by their Beloved, pleased as they were to have their memories revived by the message, thereupon addressed Uddhava. The gopîs said: 'The cause of the suffering, Kamsa, the enemy of the Yadus, has fortunately together with his followers been killed. What a blessing that Acyuta at present lives happily with His well-wishers who [therewith] achieved everything they desired. Oh gentle one, maybe the elder brother of Gada [Krishna, see 9.24: 46] gives the women of the city the love that belongs to us, we who affectionately revere Him bashfully with inviting smiles and glances. How will our Darling, so versed in all the matters of love, not become bound by the bewildering gestures and words of the city women, who are also [just as we] constantly of worship? And... does Krishna, oh pious one, remember us; does He ever mention us, village girls, when He freely talks in the company of the city women? Does He recall those nights in which He enjoyed in Vrindâvana, that place so enchanting because of the lotus, the jasmine and the moon? He at the time with tinkling ankle bells danced with us, His beloved girlfriends, who glorified Him for His attractive stories. Will that descendant of Das'ârha return to this place and with His touch bring us back to life who are tormented by the sorrow He gave rise to Himself? Will He do that just as Indra with his clouds would [replenish] a forest? But why would Krishna come here now that He, surrounded by all His well-wishers, is happy having attained a kingdom, having killed His enemies and having married the daughters of kings? What purpose would there, for us forest-dwellers or for other women, be to fulfill unto Him, the great Soul and husband of the goddess of fortune, whose every desire is already fulfilled? He is complete in Himself! The greatest happiness is found in non-expectancy, so even the unchaste Pingalâ stated [a courtesan, see 11.8]. Yet, for us focused on Krishna who very well know this, it is most difficult not to cherish any hope. Who is capable of forgetting the intimate talks with Uttamas'loka, He from whose body the goddess never moves away despite Him not desiring her? In the company of Sankarshana, oh prabhu, Krishna with the cows and the sounds of the flute passed through the different places in the forest, by the rivers and the hills. Ah, time and again those places carrying the glory of His footprints, remind us of the son of Nanda we can never forget. Oh, how can we ever forget Him with our hearts being stolen by His lovely gait, His playful glances, His generous smiles and nectarean words? S'rî S'uka said: 'With their fever of separation removed by Krishna's messages, they thereupon worshiped him, Uddhava, recognizing him as Adhokshaja Himself. Remaining there for some months he, singing about the topics of Krishna's pastimes, gave joy to Gokula by dispelling the sorrow of the gopîs. All the days that Uddhava dwelled in Nanda's cowherd village, passed for the residents of Vraja in a single moment, because they were filled with discussions about Krishna. Seeing the rivers, forests, mountains, valleys and flowering trees, the servant of the Lord took pleasure in reminding the people of Vraja of Krishna. 'On this earth these young cowherd women are the only ones of [real success] in acquiring a body, for they achieved the perfection of an exclusive love for Govinda, the Soul of All - a love that is desired by sages, by ourselves and by those afraid of a material existence. Of what use would the [three] brahminical births be [of deriving an existence from one's parents, one's guru and one's sacrifices] for someone who has a taste for the topics of the Unlimited Lord? What is one compared to these women who, impure in their conduct towards Krishna, wander in the forests? What is one's position compared to this stage of perfect love for the Supreme Soul? For the one who is of constant worship, even when he is not very learned, most certainly the Lord directly bestows the highest good, the good that imbibed works like the king of all medicines [that is: irrespective the person]. The blessing the Vraja ladies found in the embrace of Uttamas'loka in the râsa dance, was not bestowed on the goddess on His chest who is so intimately associated with Him, was not His mercy for the heavenly damsels with their lotus flower scent and luster, nor was it granted to any other kind of woman [10.33]. Oh, let me be devoted to the dust of the lotus feet of the gopîs in Vrindâvana! Let me be any of the bushes, creepers or herbs there [in relation] to them, to those women who in worship of the feet of Mukunda, whom one seeks with the help of the Vedas, abandoned the path of civil correctitude and left behind the family members that are so difficult to give up. The feet of the Supreme Lord where the goddess, Lord Brahmâ and the other gods with all their desires fulfilled, just like accomplished masters of yoga, can only dream of, were by Krishna in the gathering of the râsa dance placed on their breasts, so that they by embracing them could overcome their anguish. S'rî S'uka said: '[Uddhava,] the descendant of Das'ârha thereupon took leave of Yas'odâ, Nanda, the gopas and the gopîs, mounted his chariot and was about to leave. 'May our mental activities be founded on Krishna's lotus feet, may our words be an expression of His names and may our bodies when they bow down and such, do so for His sake. After the gopas thus had honored him with Krishna bhakti, oh first among men, Uddhava returned to Mathurâ, the city that [now] enjoyed the protection of Krishna. *: To substantiate the claim that this concerns Râdhâ, quotes S'rîla Jîva Gosvâmî the following verses from the Agni Purâna: "At dawn the gopîs inquired from Krishna's servant, Uddhava, about the Lord's pastimes and recreation. 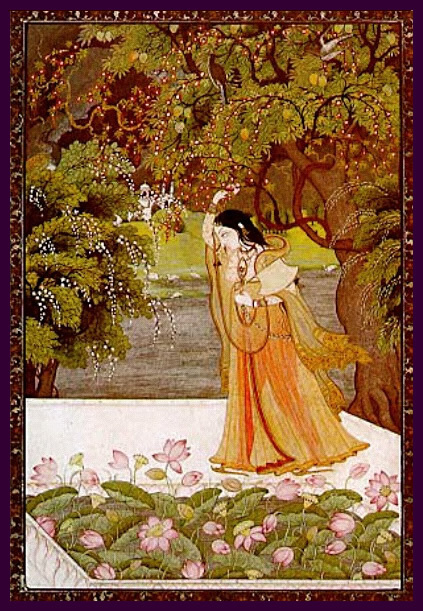 Only S'rîmatî Râdhârânî, immersed in thought of Krishna, withdrew Her interest in the talks. Then Râdhâ, who is worshiped by the residents of Her Vrindâvana village, spoke up in the midst of Her girlfriends. Her words were full of pure transcendental knowledge and expressed the ultimate portion of the Vedas." **: S'rîla Vis'vanâtha Cakravartî points out that this and the following nine verses exemplify ten kinds of impulsive speech [citra-jalpa or strange chatter] spoken by a lover as expressions of godconscious folly or divine madness [divyonmâda]. S'rîla Rûpa Gosvâmî in the Ujjvala-nîlamani (14.182) says to this expression: "Prajalpa is speech that denigrates the tactlessness of one's lover with expressions of disrespect. It is spoken in a mood of envy, jealousy and pride." *4: Ujjvala-nîlamani (14.186): "According to learned authorities, vijalpa is sarcastic speech that is addressed to the killer of Agha and that openly expresses jealousy while at the same time hinting at one's angry pride." *5: Ujjvala-nîlamani (14.188): "The declaration of Lord Hari's duplicitous nature in a mood of spite born of pride, together with jealously spoken insults directed against Him, has been termed ujjalpa by the wise." *6: Ujjvala-nîlamani (14.190): "The learned describe sañjalpa as that speech which decries with deep irony and insulting gestures the beloved's ungratefulness and so on." *7: Ujjvala-nîlamani (14.192): "Saintly persons have concluded that when a lover, impelled by jealousy and fear, declares that Lord Hari is unworthy of her attachment because of His harshness, lustiness and dishonesty, such speech is called avajalpa." *8: Ujjvala-nîlamani (14.194): "When a lover indirectly states with remorse that her beloved is fit to be given up, such speech, uttered like the plaintive crying of a bird, is called abhijalpa." *9: Ujjvala-nîlamani (14.196): "A statement spoken in disgust, describing how the male lover is deceitful and brings one misery, and also implying that He gives happiness to others, is known as âjalpa." *10: Ujjvala-nîlamani (14.198): "When the lover humbly states that although she is unworthy of attaining her beloved she cannot give up hoping for a conjugal relationship with Him, such words, spoken with respect for her beloved's message, are called pratijalpa." S'rîla Vis'vanâtha Cakravartî explains that the goddess of fortune, S'rî, has the power to assume many different forms. 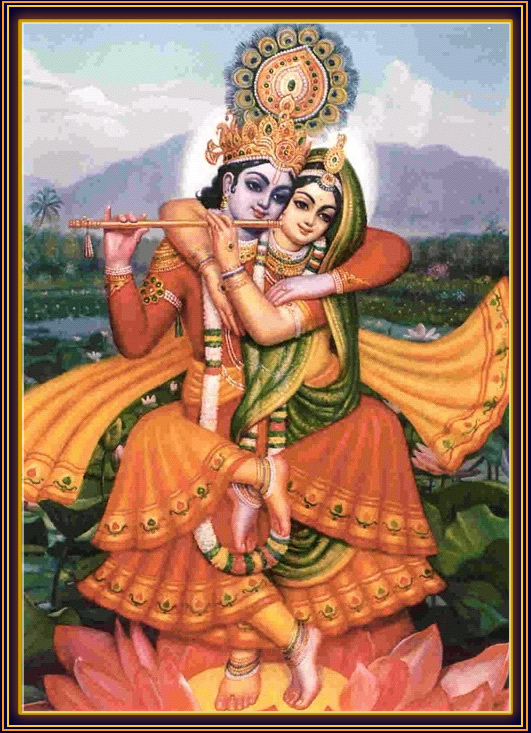 Thus when Krishna enjoys other women, she stays on His chest in the form of a golden line. When He is not consorting with other women, she puts aside this form and gives Him pleasure in Her naturally beautiful form of a young woman. *11: Ujjvala-nîlamani (14.200): "When, out of honest sincerity, a lover questions S'rî Hari with gravity, humility, unsteadiness and eagerness, such speech is known as sujalpa." 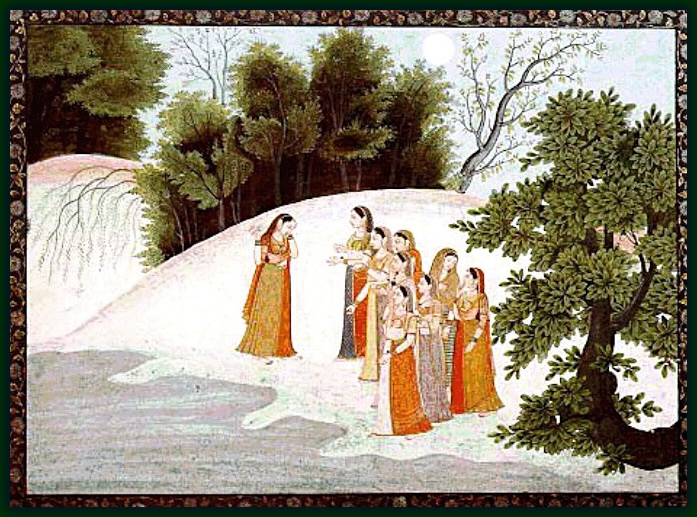 The first two paintings on this page are classical Rajasthani pictures of Radha and the Gopis in separation.